Classic Army is a leading manufacturer of Airsoft products, setting standards for the entire industry. This model of the N4 HOG AEG will ship directly from the manufacturing center. Additionally, N4 HOG AEG is priced lower since the product is coming from Hong Kong! This is literally one of the best deals on Earth considering the package can ship to any country where its legal. It's time to get your hands on this affordable deal coming straight out of the factory! The Classic Army N4 HOG is a full-metal M4 with a great number of features to satisfy your needs. 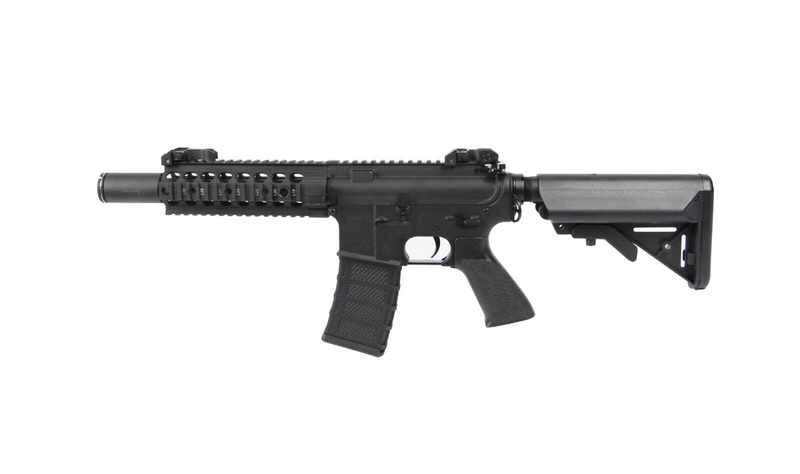 It has a 7.5" CQB-length outer barrel surrounded by a 7" CNC-machined free-float rail system with a realistic look. In addition to realism, the metal construction of this black gun delivers durability and a great feel and heft. The top monolithic rail system offers enough space to use optics, lights, lasers, forward grips or other accessories to adapt to any situation or environment. The gun also comes with flip-up front and rear sights, an ergonomic grip and a 300rd high-capacity magazine. The magazine for this great gun can hold up to 300 rounds, giving you staying power in any encounter. Muzzle velocity of 375-400 FPS gives you plenty of firepower when you need it. The gun is packed with great internals from Classic Army. The 9mm bearing gearbox hosts an inline MOSFET protected trigger contacts, stainless steel bore up cylinder, aluminum bore-up cylinder head, metal spring guide with bearing, 6.03mm tight-bore barrel, silver low-resistance trigger wiring and a quick-change spring system. The quick-change spring system allows for fast and easy spring changes without having to go into the gearbox.